For pedestrians, cyclists and drivers alike, Crystal City has never been the easiest neighborhood to navigate — and Amazon’s looming arrival in the neighborhood has stoked fears that things could get worse in the area long before they get better. But now that the tech giant has officially picked Arlington for its new headquarters, county officials are free to unveil their grand plans for allaying those concerns and fundamentally transforming transportation options along the Crystal City-Pentagon City-Potomac Yard corridor. Virginia’s proposed deal with Amazon calls for the pairing of state dollars with money from both Arlington and Alexandria to make a variety of projects long envisioned for the area a reality — so long as the tech giant holds up its end of the bargain and creates targeted numbers of new jobs, of course. It adds up to a complex mix of funding sources that defies easy explanation, but would be in service of a massive shift in the transportation network surrounding the newly christened “National Landing.” And, as last week’s nightmarish traffic conditions created by the shutdown of the Crystal City and National Airport Metro stations helped prove, the county is in desperate need of an upgrade in the area. Certainly, the aforementioned projects were all on various county wish lists over the years — the Crystal City Transitway expansion to Pentagon City is perhaps the most developed of any of the proposals, with the county convening a public meeting on the matter just last week. The difference is that many of the projects have largely lacked the necessary funding to move forward. The county still needs another $15 million to fund the Transitway project, which is now set to come from the state, and the other efforts need substantially more money than that. The second entrance at the Crystal City Metro station has been a particularly challenging project for the county. The Northern Virginia Transportation Authority, a regional body doling out funding for transportation projects, recently awarded Arlington only a small shred of the funding it was looking for to move the station forward. The county’s gloomy revenue picture previously forced Arlington to push the project off into the long-term future, and it remained a very open question whether the second entrance would score highly enough on state metrics to win outside funding. Those concerns vanish virtually all at once for the county, and that could be quite good news for both Crystal City residents and Amazon’s future workers. Though the exact details need to be worked out, the new entrance would be located at the northwest corner of the intersection of Crystal Drive and 18th Street S., with $82.5 million of the project’s $90 million price tag coming from the state through the Amazon deal. Cristol hopes the project will “transform the beating heart of Crystal City” and encourage its new residents to rely on Metro. She notes that the Crystal City and Pentagon City Metro stations have seen a combined 29 percent drop in ridership since 2010, as the military and federal agencies moved out of the area, and hopes thoughtful transit strategies around Amazon’s arrival will reverse that trend. 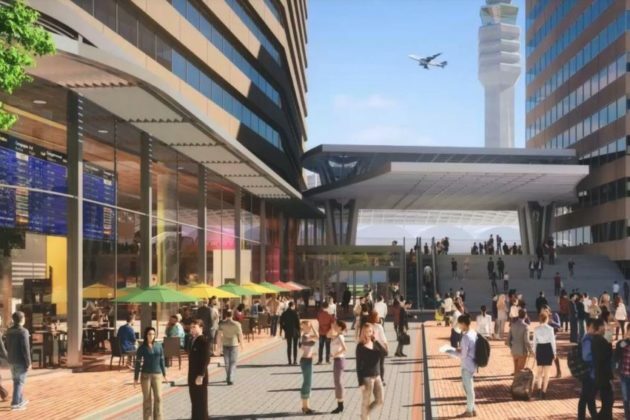 Stewart Schwartz, executive director of the transit advocacy-focused Coalition for Smarter Growth, added that a second entrance will help the area manage demand as thousands of employees flock to one of Metro’s sleepier stations. Schwartz also hopes the new entrance will provide better accessibility to the area’s Virginia Railway Express station (located a few minutes’ walk up Crystal Drive) for anyone looking to reach the more distant sections of D.C., or Northern Virginia’s outer suburbs. 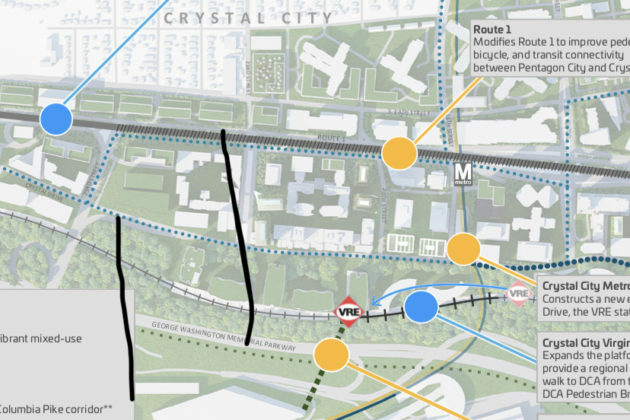 The VRE is even weighing an expansion of the station in the coming years, which would put an entrance directly across from the second Metro access point. County Board member Erik Gutshall points out that the proposed bridge to DCA would land in just about the same spot. 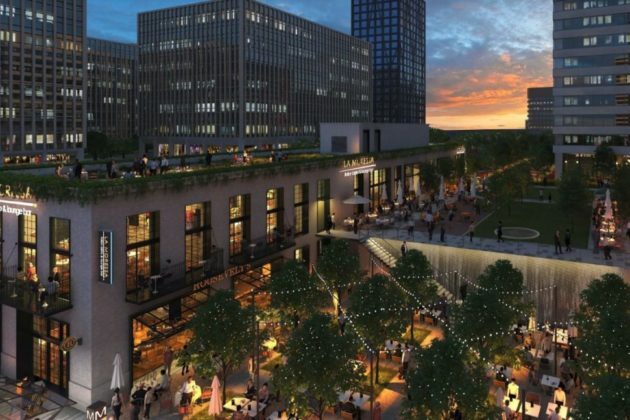 A feasibility study backed by the Crystal City Business Improvement District suggested that an office building at 2011 Crystal Drive would make the most sense for the pedestrian connection, which Gutshall notes also matches up with an entrance to the Mt. Vernon Trail. All of that could someday add up to a promising transit hub in the area, which developer (and future Amazon landlord) JBG Smith has already begun advertising in its marketing materials. “You can bike, walk, ride VRE and ride Metro, all together,” Gutshall said. The project will need about $36 million to become a reality, with $9.5 million chipped in from the state and the rest coming from Arlington and the NVTA. The county will need even more cash for the Route 1 improvements: about $250 million in all, with $138.7 million coming from the state’s Amazon deal. The proposal doesn’t include a funding stream for the rest, but the changes could be quite substantial indeed. The documents don’t lay out details beyond a goal of improving the “pedestrian improvements” on the road, but officials say a guide could be the changes detailed in the county’s Crystal City sector plan. Those plans involve bringing the highway to the same grade as other local roads, eliminating the soaring overpasses that currently block off large sections of the neighborhood. “This may, in fact, lead to the total reimagining of Route 1,” Dorsey said. In all, the county expects to spend about $360 million — about $222 million in already committed funding and $137 million in future grants — to fund transportation improvements in the area. The state’s total could one day go as high as $295 million, depending how many workers Amazon ends up hiring for the area. The county’s commitment is large enough to give some local budget minders heartburn. County Manager Mark Schwartz has often warned about the strain on the county’s debt limit precipitated by recent fiscal pressures, and taxes may well go up on residents in the coming years, even with the Amazon revenue windfall. But Dorsey waived those concerns away, noting that the county has long planned for the spending associated with many of these projects, and will have hefty state dollars to rely on for the rest.